Sample lease only, actual lease may vary based on the unit and unit location. Below you will find our rental application. We have provided it in two formats. One is a PDF which you can print, fill out, and then fax back to us at (802) 862-2805. The second is the online application, which you may fill out below. Please fill out entire application, though you may note where items are not applicable. When complete, click on Submit at the bottom of the page and the form will be emailed to Rieley Properties. All adults, regardless of marital status, will each be required to fill out a separate application form. Please Note: By filling out this information and clicking Submit, you agree to allow Rieley Properties access to your credit history. 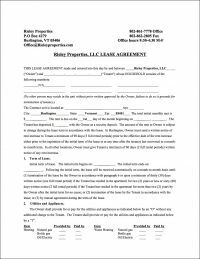 These forms can be used if you would like to fill out them by hand and mail or FAX it to Rieley Properties.